Cammy Bean's Learning Visions: Essential Reading for Instructional Design? 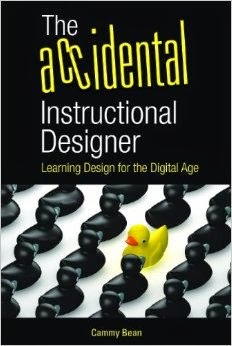 Essential Reading for Instructional Design? 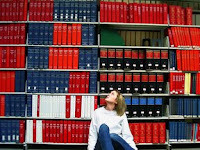 As an instructional designer/eLearning professional, what books are the essential tools in your reference library? I'm not looking for the obtuse theory books. I prefer the get-down-and-dirty variety. Last May, I started a bit of a list in this post: Beginning Instructional Designer's Toolkit. The Non-Designers Design Book by Robin Williams (not the comedian) (this was recently recommended to me by someone who asked the same question on LinkedIn. What would you add? Or can we stop? I'm already feeling a bit overwhelmed. Perhaps we need to start a lending library. First Principles is a paper, not a book. You can find the latest version of it here. Also, you can find the 4C/ID model (from von Merrienboer's book) here. I'm about halfway through Michael Allen's new book, Designing Successful E-Learning. I think that's another one to add to the list. This will be a really nice resource to have--thanks for collecting this list. Blimey Cammy, I just put in one big request to the boss for an Amazon order. Between you and John I'm going to need to ask for a visit to Ikea for a new bookshelf too! Oh, and as I mentioned in a recent entry on my blog, Don't Make Me Think by Steve Krug is useful on the usability stakes - perhaps more so when you step from courseware and in to the wider field of elearning/performance support. Let me second "Don't Make Me Think." Also, "Efficiency in Learning" covers some of the same territory as "Elearning and the Science of Instruction" but is more recent. I love Michael Allen's work and also here are a couple of books by Roger Schank. These have been very valuable to me in the way I think about how and where elearning can be most effective. Thanks for all of the great additions! I'll create an updated master list at some point...Seems like many of us have been thirsting for an essential reading list. In addition to van Merrianboer and Norman, don't miss Writing Training Materials That Work: How to train anyone to do anything by Foshay and Silber. I worked with Rob Foshay at PLATO in the 90's; this text distills the approach we used to creating instructional materials that delivered on the promises. Good Edition for your bookshelf. We have a lending library with most of these books at MASS ISPI. Yet another reason to join us! Cammy, you'll be astonished to hear that Ten Steps to Complex Learning has van Merriënboer's stuff, along with Paul Kirschner's. It's not really their fault that the 10 steps took me 21 posts on my blog (starting here). I actually found it very useful as a foundation--though it felt at times like pouring concrete through a garden hose. The book builds on the 4C/ID model described in the 2002 article that John Curry linked to. In addition, though I'm going outside the instructional design fence, I think it's vital for a designer to understand the larger context. There's Allison Rossett's First Things Fast, a new edition this year, to help identify the problem. This is a great list Cammy. I strongly recommend Ruth Clark & Michael Allen. David Merrils paper on First Instructions is wonderful too. I've not seen John's link to tuition free ID course so far - thanks for pointing to that. Ooooo....Im stoked to find this list. Are there any you would add since this was first posted in 08? awesome sauce. thanks. All IDs should read Made to Stick by Dan and Chip Health. Fantastic book. Everyone responsible for communicating messages for change should read Made to Stick by Dan and Chip Health. Thanks for putting up the list on the site. On my desk here, I already have some of the books that you mentioned that I keep near me, regularly referred to in my job. My colleagues laugh at my books but I treat them dearly because they have served me well over the years in my work as an instructional designer. Thanks for the post! I'm new to ID but come from K-12 background -- Horton's e-Learning by Design would be good for someone without out teaching experience -- but I'd look for something else if you're already an experienced instructor. This is a great list Cammy. In my Instructional Design for Technical Communicators class, we had to read Marina Arshavskiy's Instructional Design for ELearning book. The content of the book is excellent. I will use this book as a reference when I graduate and get an ID job. Who Gets to Be Called an Instructional Designer?